The first was a limited “power of attorney”. The second was unlimited. This unlimited “power of attorney” was authorized before His crucifixion. It was to become effective when the Holy Ghost came – Luke 24:49 and Acts 1:8. On the day of Pentecost this “power of attorney” was made fully operative. The Spirit came. First, legally: They had His Word. Then, vitally: He sent His Spirit. Peter and John instantly grasped the significance of the Name. Passing into the temple they met a crippled beggar. He was 40 years old, and had been crippled from birth. Peter commanded: “In the Name of Jesus Christ of Nazareth, rise up and walk!” Heaven’s lightning struck that man. He leaped to his feet, whole. Matchless Name! The secret of power was in it. When they used the Name, power struck. The dynamite of heaven exploded! Peter and John were hustled to jail. The church prayed for them in “the Name”. They were released. They went to church. The entire church prayed that signs and wonders might be done. How did they pray? In “the Name!” They used it legally. The vital response was instantaneous. The place was shaken as by an earthquake. Tremendous Name! Jesus commanded: “Go into all the world! What for? To proclaim that Name. To use that Name. To baptize believers. How? In the Name (His authority, what He commanded). Amazing Name! In it was, concentrated the combined authority, resident in the Father, the Son, and the Holy Ghost. Almighty Name! The apostles used the Name. It worked. The deacons at Samaria used the Name. The fire flashed. Believers everywhere, forever, were commanded to use it. The Name detonated, around the world. Later, Jesus found him and said to him, “Dost thou believe on the Son of God?” The man asked, “Who is He, Lord, that I might believe on Him.” Jesus answered, “I that speak unto thee am He.” The struggle of the centuries has been to free the soul from narrow interpretations. Jesus has sometimes been made to appear as a little bigot, sometimes as an impostor. The world is still waiting to see Him as He is, Jesus the Magnificent, Jesus the giant, Jesus the compassionate, Jesus the dynamic, the wonder of the centuries. Take the shackles off God. Let Him have a chance to bless mankind without limitations. As a missionary, I have seen the healing of thousands of heathen. Thus was Christ’s love and compassion for a lost world revealed. 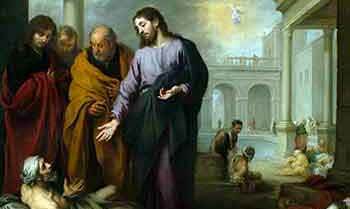 The writer of this letter is mistaken in thinking that Jesus always healed instantly. A case in point is the healing of the ten lepers: “As they went they were cleansed.” The healing virtue was administered. The healing process became evident later. Again, Jesus laid His hands on a blind man, then inquired, “What do you see?” The man replied, “I see men as trees walking.” His sight was still imperfect. Then Jesus laid His hands on him the second time and “he saw clearly”. The miracles of Jesus have been the battleground of the centuries. Men have devoted their lives in an endeavor to break down faith in miracles. More believe in miracles today than ever before. Pseudo-science declares miracles impossible. Yet the biggest men in the scientific world are believers in the supernatural and know that miracles are the discovery, the utilization of which the material scientist knows nothing. The miracle realm is man’s natural realm. He is by creation the companion of the miracle-working God. Sin dethroned man from the miracle-working realm, but through grace, he is coming into his own. It has been hard for us to grasp the principles of this life of faith. In the beginning, man’s spirit was the dominant force in the world. When he sinned, his mind became dominant. Sin dethroned the spirit and crowned the intellect. But grace is restoring the spirit to its place of dominion. When man comes to realize this, he will live in the realm of the supernatural without effort. No longer will faith be a struggle, but a normal living in the realm of God. The spiritual realm places man where communion with God is a normal experience. Miracles are then his native breath. No one knows to what extent the mind and the spirit can be developed. We have been slow to come to a realization that man is a spirit and his spirit nature is his basic nature. We have sought to educate him along educational lines, utterly ignoring the spiritual, so man has become a self-centered, self-seeking being. Man has lost his sense of relationship and responsibility toward God and man. This makes him lawless. We cannot ignore the spiritual side of man without magnifying the intellectual and the physical. To do this without the restraint of the spirit is to unleash sin and give it dominance over the whole man. There must be a culture and development of the spiritual nature to a point where it can enjoy fellowship with the Father God. It is as above mind, as God is above nature. Man’s intellect is ever conscious of supernatural forces that he cannot understand. He senses the spirit realm and longs for its freedom and creative power but cannot enter until changed from self and sin, the spirit enthroned and in action rather than the intellect — SPIRIT above BOTH MIND and MATTER. The Life of God, the Spirit of God, the Nature of God, are sufficient for every need of man. In the highest sense of the word, he is real Christian whose body, soul, and spirit alike, are filled with the Life of God. Healing in any department of the nature, whether spirit, soul or body, is but a means to an end. The object of healing is health, abiding health of Body, Soul and Spirit. The healing of the spirit unites the spirit of man to God, forever. The healing of the soul corrects psychic disorder and brings the soul processes into harmony with the mind of God. And the healing of the body completes the union of man with God, when the Holy Spirit possesses all. I experienced this a few months ago. I thought I was talking to my dad through a friend with a ‘gift from God’. It was actually a bad spirit and only when I prayed ‘in the name of Jesus I command this bad spirit to leave me’ did it leave me. It’s so amazing!!! The blind see, the lame walk, the deaf hear and the sick are healed at the mention of the “Name of Jesus”. Everything you do in the “Name of Jesus” you will surely emerge victorious. All power, all authority using the name of Jesus with faith. In the name of Jesus the Christ. Everyone respond to his/her name. Glory! Jesus is no exemption. He even responds faster than the speed of light. Halellujah! The name of Jesus is truly great. i have been blessed by this great teaching i now know the powerful tool to use any time i faces difficulties. that powerful tool is the name JESUS.